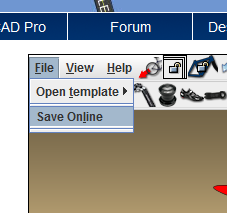 To save your design in the free version of BikeCAD, just go to the File menu and choose Save Online. This menu will only be available if you are logged in. Once you click Save Online, you will be presented with the Notes dialog box as shown below. For info on saving BikeCAD files online from BikeCAD Pro, see: bikecad.ca/opening_and_saving_online. Be sure to complete the fields in the Notes dialog box that are relevant to cataloging your design such as Brand, Model, Style, Materials, etc. At this point, you can also select options that determine how much you intend to share your design. 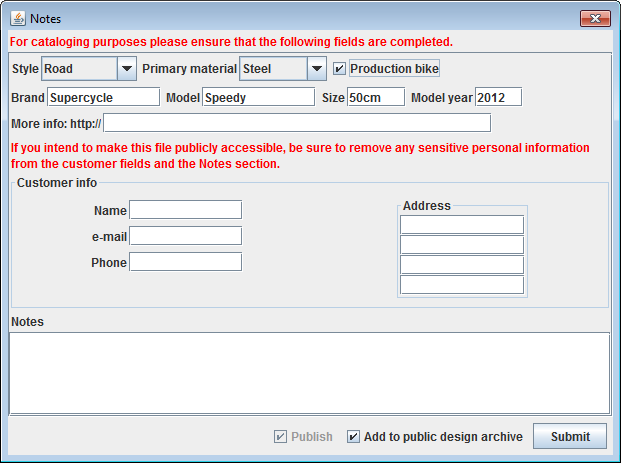 For more info on that, check out Setting Permission Levels on BikeCAD Models.